UPDATE: We regret to inform you that Casino-Mate is no longer open to Australian players. 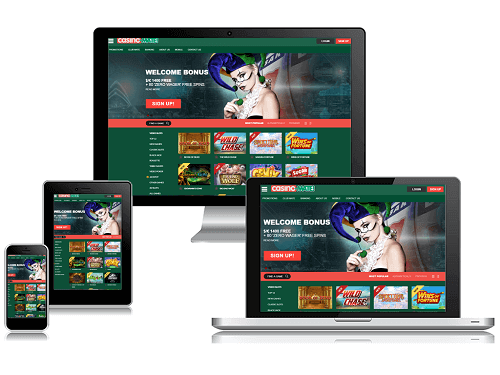 We recommend visiting our real money casino page for a complete listing of online casinos accepting Aussie players with reviews, payout percentages, number of pokies, and more. Casino-Mate was established in 2011 and offers players a unique Australian experience and the best casino online bonuses. Casino-Mate is a multi platform online casino, meaning it has games from a variety of software providers. These include Microgaming, Play ‘n Go, Quickspin, Spigo, and Betsoft. The Welcome Bonus at Casino-Mate is split up into 4 tiers or 4 deposits. On your first deposit you will receive a 100% Match Bonus up to AU$200, on your second deposit you will receive a 50% Match Bonus up to AU$300, on your third deposit you will receive 50% Match Bonus up to AU$400 and on your final deposit you will receive 50% Match Bonus up to AU$500. All in all that’s an amazing AU$1400 Bonus. You will also receive an incredible twenty ‘Zero Wager’ spins with each of your first four deposits, giving you a total of 80. .
You will not be disappointed with the game selection at Casino-Mate. The casino offers all the new games out and all the classic favourites as well. The game suppliers at Casino-Mate are not going to let you down in this department, you can enjoy the best pokies, the best Blackjack and Baccarat Variants, you can also enjoy Roulette, craps and many more exciting games.